MagePlus vs AbleCommerce - Choose the Best One for You? MagePlus vs AbleCommerce – Choose the Best One for You? MagePlus with Magento and AbleCommerce are two popular eCommerce solutions out there. But selecting the best eCommerce solution for your business among these can be a little bit confusing. 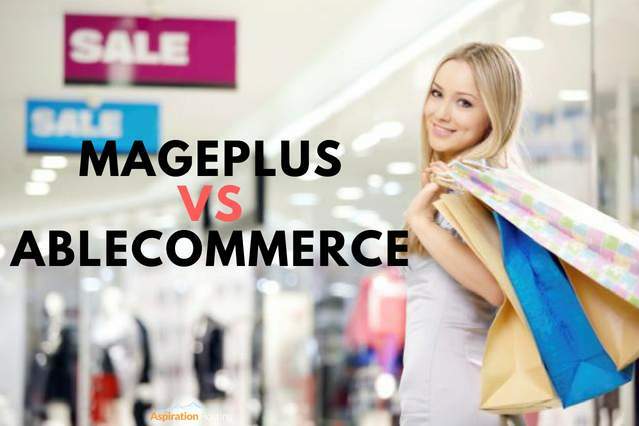 In this post, you can find a head to head comparison between MagePlus vs AbleCommerce. MagePlus vs AbleCommerce – Which is Best? MagePlus is a hosted eCommerce solution based on Magento which will help you to launch your online store in just one day. Online selling became very easy and scalable with MagePlus. Starting an affordable Magento store became easy with MagePlus. 1000+ extensions available in the Magento store will help you to add any feature to your store as simple as slicing a cake. But the number of plugins available for AbleCommerce is very limited. Availability of themes is another major distinction between MagePlus vs AbleCommerce. There are only 20+ themes available with AbleCommerce. But 1,000+ Magento themes available in various online stores make MagePlus unique. With MagePlus, you will get the source code of the MagePlus store for free. But with AbleCommerce, you have to spend $995 extra to get the source code. Finding the best hosting for your store is a nightmare for many online sellers. But with MagePlus, you don’t have to worry about it. Aspiration Hostings’ reliable cloud servers will ensure the best performance for your MagePlus stores. We are ensuring 99.9% uptime backed up with a service level agreement. Also, the cloud SSD drives of Aspiration will ensure the best speed for your online stores. With AbleCommerce, you have to buy the software and the hosting separately and configure it yourself. But if you choose Mage Plus, our techs will install and configure your site. So, you can spend your valuable time on building business rather than figuring out how to configure your store. MagePlus offers 3 plans. That is ‘Basic – $29.99/month’,’Standard – $79.99/month’, and ‘Advanced – $299.9/month’. The pricing of Able Commerce is very confusing. You have to pay separately for the software and hosting. Also, the cost of software starts from $495 annually and the hosting charges start at $99 per month. MagePlus is providing more features like unlimited bandwidth, unlimited staff accounts with much less cost compared to Able Commerce. Therefore, if you are looking for an affordable eCommerce solution, then it will be best to choose MagePlus.